This one-bedroom suite is located on the ground floor of our Sea Sprite on the Estuary Hotel. 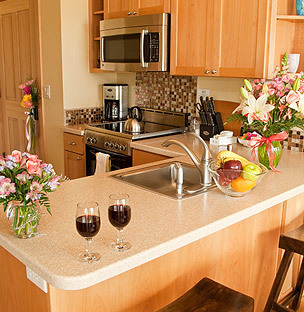 Comfortable enough to feel like your own private beach home, come enjoy this peaceful retreat. This ocean front unit features a full kitchen, gas fireplace, ADA walk-in shower, private balcony, 32" flat-screen televisions in the living room and bedroom, hardwood floors, stone tiled bathroom, stainless steel appliances and solid surface kitchen counters with sea-glass tiles. Enjoy the sweeping ocean and estuary views from the living room, dining room or private balcony. 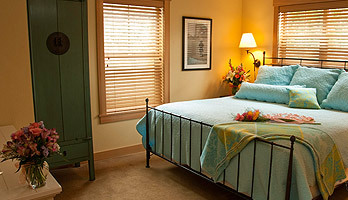 Perfect for either a couple or family, the Driftwood Suite has a king-size bed in the bedroom and a queen-sized Murphy Bed in the living room. Sleeps 4 people.